user-friendly, customizable dashboards and alerts all come together in the most comprehensive, data reporting platform available today. 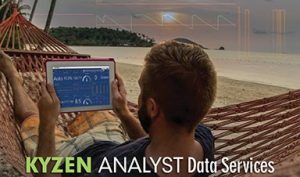 KYZEN ANALYST Data Services is now available with the KYZEN PCS (Process Control System) and it’s easily installed on your existing KYZEN PCS. Custom reports? Customer audit? Trouble shooting? Process comparisons? They’re all easy with ANALYST Data Services. View over 25 data points concerning your cleaning process from your customizable dashboard. You can even download historical data any time and quickly create accurate reports. With so much data at your fingertips, you can plan for higher quality yields, manage fewer problems and virtually stop surprise line stops. secure with KYZEN ANALYST Data Services. It’s almost like a day at the beach.